Fully refurbished throughout, this two bedroom mid row residence should be of particular interest to a first time buyer wanting to get on the property ladder or as an ideal buy to let investment opportunity. Boasting uPVC double glazing and gas central heating system, also having been freshly decorated and re-carpeted this lovely home is set in a convenient area just a short stroll to Mersey Park. Close to a good range of amenities including a Lidl supermarket, frequent bus services and those further afield in Birkenhead. Well placed for local schooling, Rock Ferry train station and St Catherine’s Hospital. Interior: living area, newly fitted kitchen and bathroom on the ground floor. Up the newly carpeted staircase to the first floor level where you will find the two bedrooms. Exterior: small stepped rear courtyard with rear access gate. Internal inspection is an absolute must in order to appreciate fully; please do not delay in contacting the team to organise your viewing! 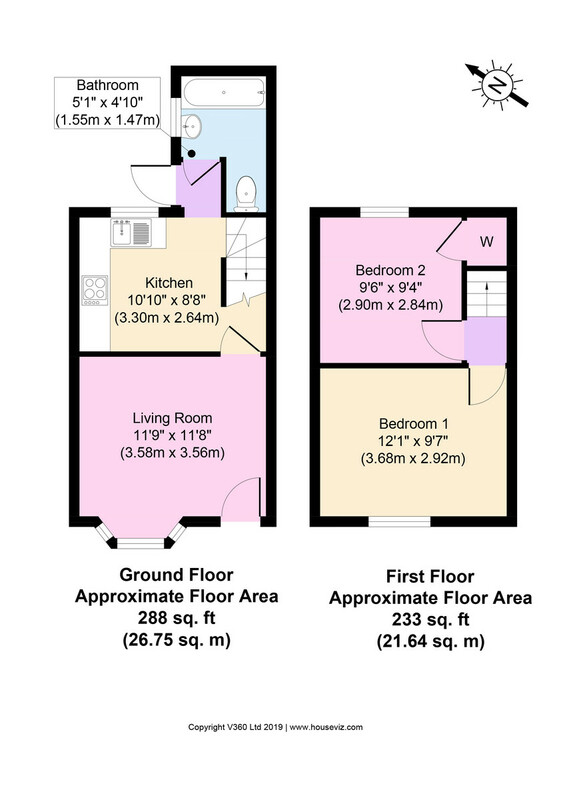 LIVING AREA 11′ 08″ x 11′ 09″ (3.56m x 3.58m) uPVC double glazed bay window to front elevation. Bright and airy having been freshly painted with television point, central heating radiator and heating thermostat. Meter cupboard and freshly laid carpet. KITCHEN 10′ 10″ x 8′ 08″ (3.3m x 2.64m) Newly fitted kitchen having wall and base cream units with black work surfaces over. Sink and drainer with mixer tap over set below the uPVC double glazed window to rear elevation. Inset four ring gas hob with electric oven below. Space and plumbing for washing machine. Extractor fan, central heating radiator, white tiled splash backs and vinyl flooring. BATHROOM 5′ 01″ x 4′ 10″ (1.55m x 1.47m) Suite comprising bath with shower over, low level WC and pedestal wash basin with mixer tap over. uPVC double glazed frosted window to side elevation. Extractor fan, central heating radiator and part tiled walls. BEDROOM ONE 9′ 07″ x 12′ 01″ (2.92m x 3.68m) uPVC double glazed window to front elevation. Freshly decorated with central heating radiator and newly laid carpet. BEDROOM TWO 9′ 06″ x 9′ 04″ (2.9m x 2.84m) uPVC double glazed window to rear elevation. Freshly decorated with central heating radiator, newly laid carpet and cupboard housing the boiler. EXTERIOR Small stepped courtyard to the rear with rear access gate.